About Vision GLOBAL WiFi Rental Service. 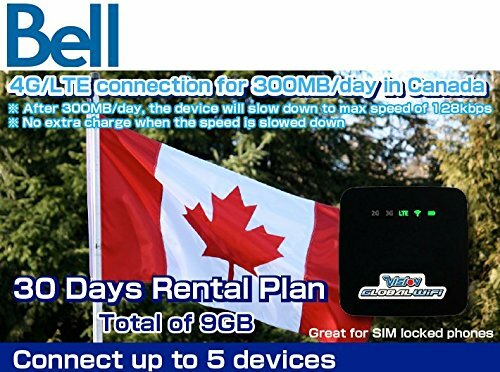 This is a 30-day pocket WiFi rental service used in Canada. Can be used with any WiFi compatible devices, even with a locked phone. Perfect for traveling and/or temporary returning to Canada. Enjoy 4G/LTE speed up to 300mb/day, afterwards it will be at slow speed until the next day (local time) with no extra charge. Request your activation to Vision Mobile USA Corp. through Amazon message and return the device when the rental term is finished with the prepaid return label and envelop included in the package. Traveling or temporary returning to Canada? Stop overpaying for roaming fee and rent our pocket WiFi hotspot for an affordable and reliable internet connection. First 9GB (30 days x 300mb/day) at True High-Speed DATA at 4G/LTE speed on Bell network in Canada. Once the daily data usage is over 300mb, the device will be at slow speed with no extra charge until the next day (local time). Request your activation once you receive the device. The device has to be activated within 7 days after you receive the package (i.e. your first day of usage must be within 7 days of receiving the package). This is a rental service. Please return the device with a prepaid USPS envelop included in the package. Secure internet connection - connects up to five (5) devices simultaneously, works with any WiFi compatible devices such as tablets, cell phones, and laptops. If you have any questions about this product by VISION GLOBAL WiFi, contact us by completing and submitting the form below. If you are looking for a specif part number, please include it with your message.